Vestris garters, anyone? What about a length of Vestris blue ribbon? Hey, is that a “Vestris grin” you’re giving me? 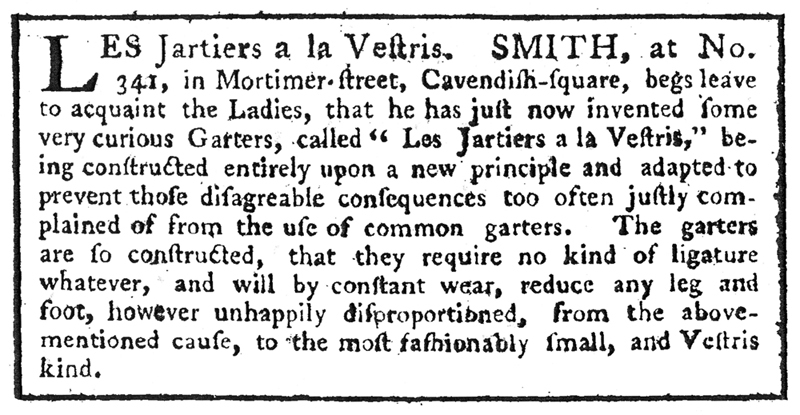 !1 In the early winter of 1780, “Vestris” became the buzz word of fashionable London. It was a name synonymous with supreme excellence, French caprice and the latest mode. The man who inspired “Vestrimania” was the twenty-year old dancer, Auguste Vestris, then making his first visit to London accompanied by his celebrated father, Gaetan. Feted by the beau monde and befriended by the Duchess of Devonshire, Auguste dazzled audiences at the King’s Theatre with his extraordinary virtuosity. Gaetan did his bit for Vestrimania, too, fielding requests for dancing lessons from all the leading families of the day. Audiences everywhere were enraptured by Auguste’s technical accomplishment and the nuanced characterization and charm he consistently delivered. The Mercure de France pronounced that his “prodigious talents have to be seen to be believed,” and remarked on his precision, strength, his graceful build and intelligence.5 Lord Pembroke, a long-time observer of opera and ballet in England, enthused “young Vestris is a wonderful fellow. 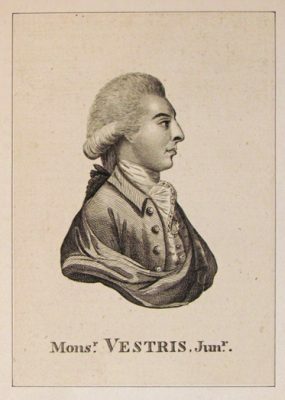 All I have hitherto seen are quite nobody to him.”6 In 1790 when Auguste performed in Lyon, a Russian visitor noted that the theatre “hummed all around us like a beehive” in expectation of Auguste’s first entry.7 “What a figure! What agility! What balance!” the young Russian gasped after seeing him; “Never did I imagine that a dancer could afford me so much pleasure!” When the audience persuaded Auguste to give an extra performance the following evening, the response was ecstatic. “I think the flighty French could, at that moment, have proclaimed Vestris their dictator,” the Russian wrote, recalling how the applause drowned out the music. What then of Auguste’s influence on ballet in Britain? Well, it was thanks to Auguste that ballet received the ultimate PR makeover in England in the early 1780s. Long regarded as a minor appendage to the Italian opera, ballet was transformed through Vestrimania into a legitimate part of British theatrical culture.8 It became, for the first time, the subject of separate reviews and notices, and a hot topic of public discussion.9 Auguste’s popularity among women, in particular, created a new market for ballet-related goods and services, and his success paved the way for a string of acclaimed dancers to visit London during subsequent seasons. The Vestris garters, described in the advertisement here, are the most curious ware that Auguste inspired. Used to keep stockings up, eighteenth-century garters were normally tied just below the knee and were fashioned from a variety of materials including satin and leather. 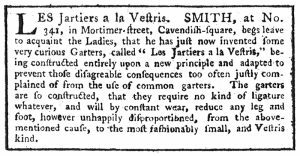 We can judge from Mr Smith’s address in London’s West End that the Vestris garters were designed for upper-class ladies. But were they are a luxury for the gullible? Or a genuine physique-changing innovation? That is a matter best left to your imagination!